Salads are much welcome as a light meal or for lunch during the hot season. Hot weather means yummy sweet watermelons and cooling cucumbers. I love combining both cooling agents to create a delicious, filling and friendly on the tummy salad. 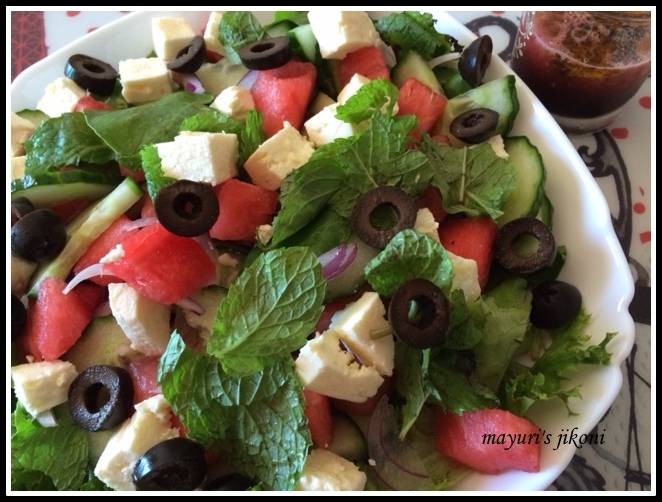 Balsamic vinegar brings out the flavour of the watermelon and the feta cheese compliments the cucumber perfectly. I read in one of those health blogs that when one eats watermelon after a meal, it makes you burp but eaten on an empty stomach it prevents burps. The reason given is that other foods and fruit in the stomach is a bad idea as it creates gas. Well, how true this is I don’t know, but having this salad as a light dinner was perfect for me. Ideal for hot humid days. Go on try this recipe out. Mix the salad ingredients together. Cover with a cling film and store in the fridge till required. Whisk the dressing and keep it ready. Just before serving, add the dressing and toss the salad lightly. Add lemon juice instead of watermelon juice. Add either black or green olives. Try adding baby spinach leaves. Add basil leaves instead of mint. love the colorful salad dear . That salad looks so refreshing – melons are often forgotten. This is such a refreshing salad. I love feta and watermelon together.